If you look at the video, you can see a four lane road with a median and an overpass. The only place this could be is Nimitz Blvd. and the overpass is Famosa Blvd. There is no overpass within the boundaries of Ocean Beach, this area is Point Loma. I sent the reporter an email yesterday and then decided to call the news desk. They said she came in to work at 3:00 p.m. and to send her an email with a phone number and she would call me back. I sent a second email with my number and got no response by phone or email. I called the news desk again on Thursday and explained what happened and told them they had misidentified this area as Ocean Beach. They asked me why the mattered and I told them that OB gets enough negative press and that they needed to correct this story. There is even a quote from Zapf in the story, who apparently also does not know OB’s boundaries. Why am I writing this? Because I would like everyone who cares about OB’s reputation to either call the Channel 10 News desk at 616-237-6383 or email the reporter, Bree Steffen at bree.steffen@10news.com and insist they correct this story. I personally am tired of the media painting OB as a solitary den of homelessness. Yes, we have ours as does Pt. Loma, Mission Beach, Pacific Beach and even La Jolla – it is not an OB only problem. 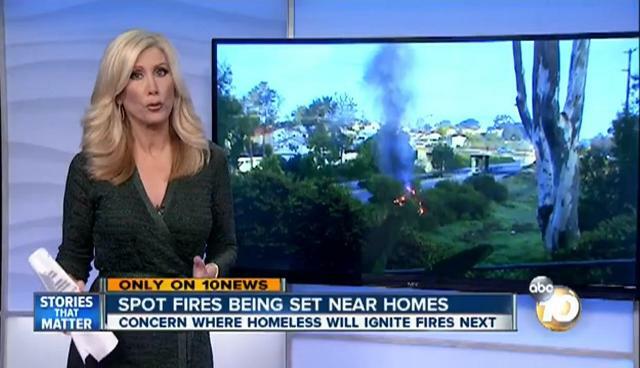 The article also mentioned a “slew of fires” and multiple OB residents but the only people in the story are a man and his small child – who live in POINT LOMA! This is about the fourth comment that asks “who cares.” Read the attribution, I care, that’s why I wrote it. And I’m guessing that other people in OB are also tired of the media unnecessarily trashing OB. I’m not sure what part of West Pt. Loma you are talking about but some of it is not in OB. And I think this is a great place to live and I am proud to say that, which is why I’m calling the media on their incorrectly written story. Thanks for bringing to everyone’s attention. I had not heard this story because I rarely watch TV news, so much appreciated. Will be emailing Ms. Steffen. Although they might have been out of OB by a small distance, I guarantee they eat everyday at one of the churches on Sunset Cliffs Blvd, beg for money on Newport Ave, go to the pier to meet up with others and get drugs, and go back to the Famosa bridge to sleep at night. The Homelessness in OB is outrageous and no other beach area in San Diego is half as bad as OB! Supporting their lifestyle is not helping them or the community. The only place worse in San Diego is the area near the homeless shelters in Downtown. I invite friends to visit me in OB and they are always shocked by the homelessness and dirty smelly hippies that loiter and beg and do drugs. It’s a running joke at many establishments, calling them “Creatures”, “Urchins”, and other names. Stop defending the lifestyle and, instead, encourage them to get off the streets! First of all, not every discussion has to be about everything. The point of this piece was just to address the media once again attributing bad happenings to OB when it wasn’t in OB. If this had happened in Lakeside and it was identified as OB, lots of folks would be upset. Just because it is in an adjacent community is no less a reason to be upset by this. Second, where do you get evidence that the homeless problem is worse than any other beach area and second only to downtown? If you want to throw out “facts” like that, then at least back them up with some attribution other than your own opinion. Third, please show me, and everyone else, where in what I wrote was there a defense of the homeless lifestyle? This was not about the homeless, that is another discussion. First off I completely agree with RC92107. I can also see how ABC 10 might have miss associated this area with OB. After all, it’s no stretch of the imagination to project the a priori state of OB to a current state where bums in OB are setting random fires. If someone described this story without telling me where it took place (other than near a beach town in SD), then my first guess would have been OB! Why is the case? It’s because it’s a well known fact that OB is full of homeless that do stuff just like this. Residents have even created names for them. Please clean up OB, or at least don’t be offended when other San Diegans make miss associations about OB that are statistically close to the current state. Enjoy your Trailer Park by the sea! I’m guessing this was some kind of troll comment, just another San Diegan who does not know Ocean Beach. The insult at the end was the obvious clue. Where are bums setting fires in OB? The news story alluded to that but provided no facts to back that up, what do you have? “…don’t be offended when other San Diegans make miss associations about OB that are statistically close to the current state.” What statistics are you talking about? And how does incorrectly identifying where a story took place have anything to do with statistics? And, I will be offended when stories about problems in other parts of San Diego are attributed to Ocean Beach. Finally, why are you even commenting since you have such a low opinion of the place, you clearly know nothing about OB other than what you see in the news and the news got it wrong. Way wrong. I suspect that Channel 10 uses newsroom gossip to define neighborhood boundaries. And I had to laugh at the reporter’s statement that the city supports installing cameras to monitor the homeless. Why not simply trim the bushes along Nimitz on a regular basis?? What I laughed at was the reporter firing up a lighter and saying “DANGER!” into the camera. This is a perfect example of why I don’t watch any local news. One of the things that I admire most about OB is its tolerance of the homeless. The fact that OB cares for large numbers of those less advantaged speaks very highly of your community and is something that OB should be proud of. I could give 2 s**** what the media or the rest of SD thinks about OB. You’re sad because it makes it harder to brag about where you live to your friends? Give me a break. Or is it hurting your property values? wwwaaaaaa waaaaaaaaaa…. Bring on the negative coverage. I would prefer every single crime that happens in the zip code to be broadcast on the 11’oclock news and attributed to OB. So if you think so highly of OB, why are you reading the OB Rag? Or are you just cruising the web looking for opportunities to display your stupidity? I’ve lived in the OB “Trailer Park” for 23 years. My children attended OB Elementary School. They somehow survived the reportedly deplorable homeless situation. I hope negative commenters on this site keep OB cool by never visiting our burgh. I love OB. And I accept the elements I don’t like because I don’t like what it’s changing into. You can’t have your cake and eat it to. There are negative consequences to positive news coverage. The media CONSTANTLY gets facts wrong. I’ve seen it time and time again, they just can’t get facts straight. They obviously don’t remember ANYTHING they learned in journalism class in college. That and the exploitation factor in all news shows turned me off to watching the news years ago. I agree with you, OB Mercy. I stopped watching TV news years a go but sometimes it intrudes regardless. I only saw this because the link was posted in the camera story. But, we all still need to speak up when they get it wrong so that maybe, just maybe, they will make improvements. The sad part of this is that a lot of people still get their news this way and don’t realize how flawed it is.